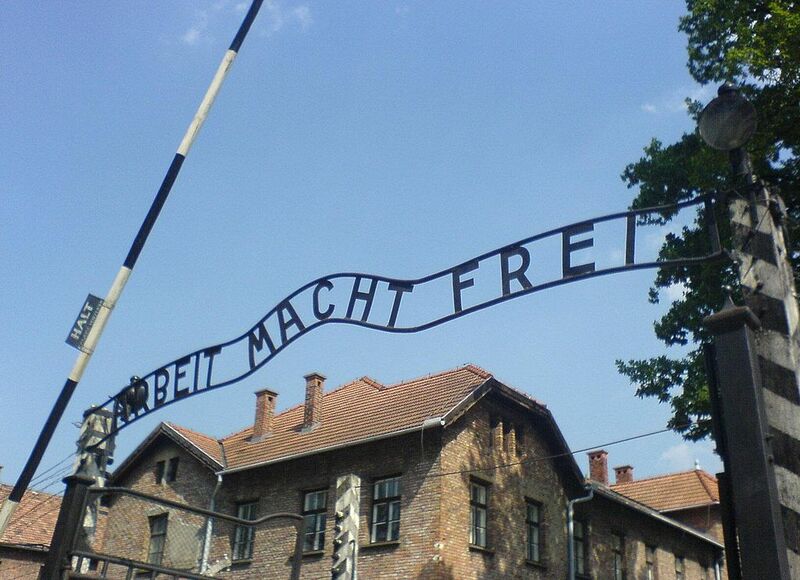 I was recently participating in a tour of the German Death Camp KL Auschwitz. The tour consisted of young people from several countries. They carried their national flags or wore scarves with their country colors. Most of the youngsters were students from Israel and from Switzerland but there were also some from other countries. The tour was escorted by a lady guide with a badge from the National Museum of Auschwitz-Birkenau in Oświecim, a Polish state institution. The group included several counsellors, who acted as translators; and also special security personnel from Israel. The tour guide started her lecture by pointing to the barbed wire and guard posts, and speaking about camp guards, their number, living conditions, families, etc. During this lecture she kept talking about SS-men. When one of the young people asked what nationality were these guard SS-men, the guide answered that “SS was a ‘military formation‘ organised by ‘nazis‘ from among young people, who after being attracted to nazi ideology were recruited to special military schools, where they were subjected to indoctrination, or straight out brainwashing, infusing of hatred towards Jews, and thorough military training”. The young person quite consciously realized that the guide did not answer his question, and he insisted on getting a reply. The lady guide again slickly avoided the question replying that “‘nazis‘ ran their propaganda throughout Europe – addressing it especially to young people; many were tricked and attracted to this indoctrination. For this reason people from many countries of Europe served in the SS – Belgians, French, Dutch, Spanish, Hungarians, Ukrainians, Latvians,etc.” She did not mention Germans. I was disturbed by this answer, so I walked up to her and said that she left out Germans. In a very calm and respectful way I asked her to provide this very basic information to the tour, and include the fact that hatred towards other ethnic and social groups, like Poles, Gypsies, disabled people and homosexuals, was also drilled into the German SS-men. The lady guide reacted sharply. First, she demanded that I do not interfere because she was on duty, she was a historian, and furthermore, she would say what she felt was appropriate and only when she felt like saying it – she would only tell the group that Poles served in the SS. Next, she started saying out loud to the group that this was an anti-semitic attack against the Jews on the tour. I was surrounded by the Israeli security men and separated from the students. Police were called in and the lady guide accused me of attacking and insulting the group, and delivering anti-semitic slogans. Luckily the policemen listened also to my side of the story and refused to follow-up on her report that I committed an offence. In my opinion, there is a direct connection between such incidents and the current Polish-Jewish crisis and the tidal wave of anti-Polish activity throughout the world. Therefore, I turn to You Mr. Prime Minister with a question — why does the Polish government continue to build and finance museums that are disseminating lies about “Polish concentration camps?“ Museums, which are visited by hundreds of thousands of tourists from around the world? In these museums the martyrdom of Poles and the crimes of Germans are concealed, instead the tourists are “informed” about alleged Polish anti-Semitism and responsibility of the Polish state and Polish nation for wiping out European Jews. It is the Polish taxpayers money that supports lies about “Polish concentration camps“ and “Polish death camps“. Most of the European Jews murdered by Germans were Polish citizens, and if it were not for the assistance of Polish government in exile and Poles in general — there would be no Jewish state, because there would be nobody to inhabit it. In the face of the current international crisis we are shocked to see the Jewish nation, prosecuted in a horrible way by Germans during the war, now talking about how the perpetrators of its tragedy were Poles. But why are we surprised? After all, Jews from around the world confront their acquired at home knowledge about Polish co-responsibility for the Holocaust during their visits in Poland, in our museums. And what do they see? The exact same thing, “Polish death camps in which our forefathers served in the SS units, and motivated by our inborn anti-Semitism, murdered our Jewish neighbors and Jews from other European countries (maybe with the modest and unwilling participation of Germans)”. We cannot expect visitors to Auschwitz to argue with guides who present Poles as responsible for annihilation of Jews; as murderers, not victims. I toured two such facilities, financed by our state and local governments, both handed over to be run by non-governmental organisations. The camp museum is dedicated to the memory of men, women and children victims of “Nazi” genocide, this is the place where their ashes lie, let them rest in peace. Hundreds of displays convince the visitors that the offenders of extermination of Jews were SS-men, or in a wider context “Nazis”. The premeditated lack of naming the nationality of these SS-men (or “Nazis”) – serves the obvious implication, if only because of camp location, that they were Poles. If anybody has any doubts as to nationality of these SS-men — then, the tour guides and counsellors confirm it. KL Auschwitz was created in 1940 for Poles in connection with a growing German terror and mass arrests of Polish citizens. Between 1940 and 1942 prisoners of Auschwitz were almost exclusively Polish Catholics. Only in 1942 the camp became the center for the final solution to the “Jewish question”, and Jews from German occupied Europe started to arrive. Among 1,100,000 of Jews deported to the camp – 300.000 were Polish citizens. the facilitators and the security guards of the camp were German (now the word “German” has been virtually erased from museum public circulation and replaced with words like SS-men or “nazis” which implies “Polish”. Polish Catholics rescued their Jewish countrymen from the German death machine by hiding and providing assistance – knowing very well that help given to Jews was penalized by the Germans with death penalty administered on the spot for the “guilty” persons and their families. Such death sentences were imposed exclusively on Polish occupied territory. The Polish underground State throughout the entire period of war fought with Germany, organized armed combat, even coordinated a struggle inside KL Auschwitz. Polish government in exile assisted Polish and European Jews in every possible way. I also wanted to turn Your attention, Mr. Prime Minister, to the way in which the ever-present tri-lingual signs in the museum inform visitors about the nationality of the victims. Except for the Jews, the nationality of victims is concealed with the word “others”. We are outraged that under the Communism Poland was silent about hundred of thousands Polish victims, but now in independent Poland, the information about 120,000 Poles murdered by Germans in KL Auschwitz is still concealed and removed, assigning them instead, collectively, to “non Jews” or prisoners of “other” nationality. This same practice routinely occurs during the official celebration of camp liberation. The organizers of this International Memorial totally omit Polish victims, only Jewish victims are presented to the world. The Association of Polish Prisoners of KL Auschwitz-Birkenau for many months battled for the right to attend the 2018 event for its members – former prisoners of the Auschwitz camp and their relatives. Following long struggle they were granted invitations for… 3 people. At the same time the Association chairwoman was put on notice that there was a ban on bringing in Polish flags and any kind of Polish national symbols. On the other hand the Israeli flags were carried in without any limitations. I repeat, displaying of the Polish white and red flags at an official international event is off limit by the order of the Polish national museum; and the former camp prisoners are banned from showing their Polish nationality, next to the ever-present Israeli flags. This calls for an action not only by You, Mr. Minister — but also by the Prosecutors Office. Few years ago a former Israeli Ambassador to Poland, Szewach Weiss, proclaimed on Polish television that the former German Auschwitz camp should be transformed into a world information center about the history of WWII for the international audience; a certain kind of “University of Auschwitz.” Honorable Mr. Deputy Prime Minister, let us listen to this wise old Jew and a great Pole, who understands the world. Let the Polish, true narrative about those terrible times shape Jewish youth from all over the world, let Poland develop this one of a kind University ensuring that the curriculum that would be taught there is created by our Ministry of Culture and National Heritage. This would not require any major financial investment – only a change of the deceptive narrative presented by the museum nowadays; exchange of misleading boards; and adding (to the new information boards) information written in language of perpetrators of the Holocaust, the German language. 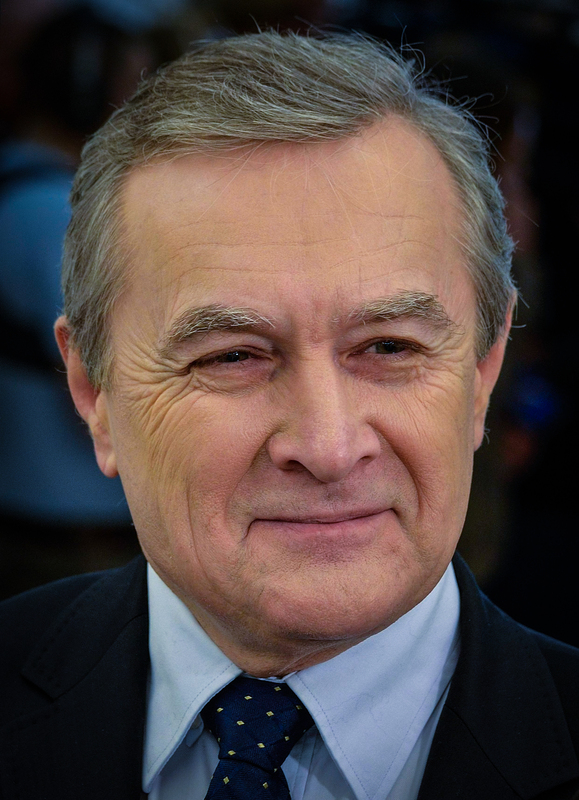 I also propose to change the street address — from the current Prisoners of Oswiecim Street, to Witold Pilecki Avenue; and to enable the cooperation with Polish NGOs, youth, patriotic organisations – that will help to present the truth to the world; and carry on the mission to create a digital KL Auschwitz University. Mr. Deputy Prime Minister, the Ministry of Culture could commission a world-renowned artist to create a display which would depict the number of citizens of all European countries that were exterminated by Germans during WWII. Such an installation could be located next to, already an icon of pop culture, the infamous camp gate that reads in German “Arbeit macht frei.” Such a display would make millions of people throughout the world tracking photos of the history of WWII to find out what was the German nazism and which nation suffered the greatest sacrifice. This artistic installation could also become an icon of KL Auschwitz, and be a symbol of truth about the Holocaust, about German crimes and Jewish and Polish victims. Why a monument to many thousands of Polish citizens involved in rescuing Jews from extermination is not standing in front of the museum? Why the efforts of the Polish Underground State and Polish nation to save Jews is not exhibited in a satisfactory way? The enormous price of assistance to Jews, including lives of people murdered together with their families by the German occupiers, is not shown. Why doesn’t the Polin Museum advertise other Institutions dedicated to the history of Polish Jews, e.g. the Museum of Poles Rescuing Jews in Markowa or the Chapel of Remembrance in Torun? And a question to the City of Warsaw — why the street names surrounding the Polin museum have not been changed to honor Polish heroes, like Jan Karski, Witold Pilecki, Henryk Slawik, Irena Sendlerowa, or the Families of Ulm, Barankow, Obuchniewicz, Dec, Skoczylas, Kosior and Kowalski? According to the media, at the time when the construction of the POLIN Museum was being completed, an apartment in Warsaw was put up for sale in which special rooms were constructed by Polish Catholic family to hide Jews. The apartment was completely preserved, with original furniture – including rooms serving as a hideout and wardrobe, which was a masked entrance to the storage room. The owner of the apartment wanted to sell it at the market price and turned to both the Polin Museum and the City of Warsaw. Neither was interested, and the apartment was sold on the open market. The new owner removed the entire installation during renovation. This led to an irretrievable loss of this priceless testimony of history. In the POLIN museum many rooms, apartments, public utility premises connected with the history of Polish Jews, and even entire streets, have been meticulously reconstructed. Why not one of the thousands of hideouts where Poles hid Jews is displayed? This small apartment, in which a Polish family of four hid a family of three of their Jewish neighbors should be displayed. And in it a table with four plates showing food rations for a 4-person family living on the Aryan side of occupied Warsaw, and next to this table another table with 7 plates showing how a Polish family shared these scraps of food with their Jewish dependents. Such two tables in the POLIN museum would tell the true story of the Polish nation under German occupation better, fuller and stronger than thousands of letters, corrections and notes written by officials of your Ministry. Another idea, why not add to the admission ticket to the Museum of the History of Polish Jews a daily food ration of a Polish child in occupied Poland? And write on this paquet a warning required by German law — that sharing of this food with a Jew would result in the death of the child and his or her family? Or ask each visitor — to use such ration for one day. And after that respond to the question would they find in themselves a sufficient amount of heroism to take away half of this food each day and feed others with it? this letter should be published in newspapers I. Poland and Polish papers I. the USA along with the,address to mail letters to regarding this travesty to tbe,Poles and never Germans is a horrible travesty of factial history. Thank you for writing this. I will disseminate it to Polish people (and others) on my Facebook feed. Your recommendations are spot on and it’s appalling that this is happening. I am an attorney in Silicon Valley and have faced anti-Polish discrimination that has hindered opportunities and resulted in financial disadvantage and lack of respect for the value I have contributed and have evidence this is as a result of my Polish last name. It must be the same for other Poles. What’s at stake is our noble and brave history — the actions of our people — and also our future because if every time we reach the next level and there is discrimination, we won’t be allowed to get to it. Someone will say something negative (not discriminatory) but say something overlooked for others, and they will choose a non-Pole. And we will be constantly held down. It’s impossible to defend against because you don’t know it until it’s too late, and Poles are not a protected class under law but are very easily identified by name. So the only way to do it is through the kinds of actions you recommend — educating the world so that bias, prejudice, hostile bigotry based on wrong information is not practiced in the first place.